It’s an oft quoted saying in the sailing community and for good reason. I made reference to the beating on the way to Bermuda. The trip from Bermuda to the U.S. Virgin Islands was no better. We waited for a change in the winds and left Bermuda on Dec. 19 at 4 p.m. The wind was out of the north-west and was perfect for our south-east course. Valhalla was running with the wind and all was well. The winds were supposed to become easterly, which would still be good for us. Instead, they were from the south-east. We were beating upwind again into 15 – 20 kt winds and “confused seas.” The wind would remain pretty constant in direction and vary from 15 – 25 kts. Usually 20 kts, but at times up to 30. As the wind increases the force on the sails increases as the square of the velocity. That means that a 30 kt wind has 4 times the force of a 15 kt wind. The rigging and the sails performed perfectly and we were able to deploy the proper amount of sail for the different conditions. We were logging great days, but it sure was uncomfortable below decks. The cockpit was comfortable, but wet. Spray would sometimes become like being hit with a bucket of water. That kept us below a lot. Below decks, our bunks were the most comfortable spots and moving around was difficult. Some of the water that landed on deck found its way below. That certainly enhanced the pleasure factor and made the floors nice and slippery. By the time we made it St Thomas, we hardly had a dry piece of clothing left. We left Bermuda without a functioning generator. That meant no refrigerator. We had ice that would last a few days. I also bought some things to eat that didn’t require cooking. I got some granola bars, bananas, apples, fig newtons, and tortilla chips to munch on when it was too rough to cook. It’s a good thing I did because on the first morning out, we found that our propane stove failed. On Dec. 22, the engine failed to start. The engine was run a couple hours per day to keep the batteries charged. The batteries run all of the lights, instruments, and most importantly the autopilot. Without an autopilot, we would have to hand steer. That would be exhausting and miserable. The problem was traced to the starter. I will post more on starters separately. The good news, we had a spare stater on board. The bad news, it would be a real chore to install. I’m no mechanic, but installing a starter is technically simple. There are 3 wire terminal connections. Plus and minus battery and ignition. The starter mounts to the engine with 3 bolts. The problem is that it’s on a boat. 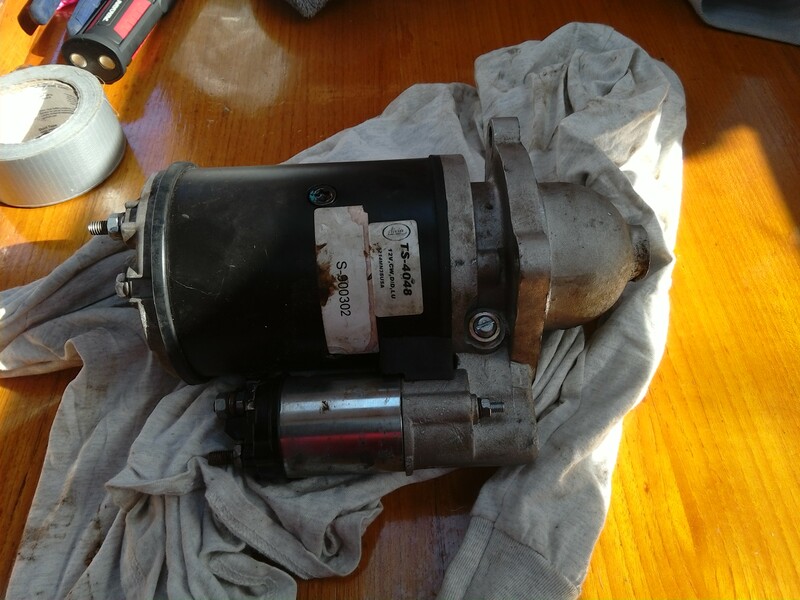 The boat is moving and auxiliary equipment has been installed that blocks access to the starter. In defense of the designer/builder, there would have been room to make this job easier if the previous owner had not installed a refrigerator compressor and some pumps to the left of the engine. On the morning of Dec. 23, I descended into the “engine room.” for what would become several hours of turning a few bolts. While below decks trying to unbolt/bolt the starter, there was no comfortable place to stand, sit, kneel, or brace against the motion of the boat. Some piece of steel was always in my back, side, shoulder, hip, etc. Parts of the cooling and air intake systems had to be removed to improve access. I can honestly say that it was the most difficult repair I ever made at sea. Several hours later, the new starter was in place. For several reasons, I only connected the battery leads to the starter and left the ignition switch disconnected. Then I started the engine by using a screwdriver to short between the + battery and the solenoid terminal. The engine started immediately. After a short “atta boy” moment, I turned off the starter battery switch to ensure nothing could cause that starter motor to run. 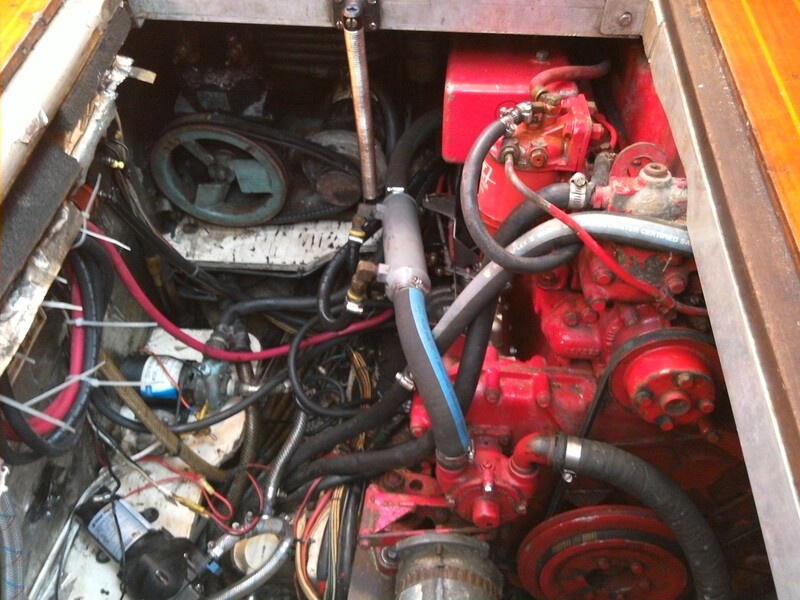 Diesel engines only need the battery to start and will continue to run without it. We decided to keep the engine running for the duration of the trip. On the morning of Dec. 24 it was obvious that we couldn’t make it to the passage between the island and Puerto Rico before dark. Entering a port for the first time in the dark is an unsafe practice. We both knew that we would have to slow the boat,, spend another uncomfortable night at sea, and make our final approach at dawn. That’s what we did and we made it into a marina on Christmas Day. Now we are drying out, assessing work to be done, and preparing for the next stage. I am going home on Dec. 28 and Bob’s son is coming for a visit. Then Bob goes back to the states to take care of family and personal business. We are reconsidering the continuation of the trip which will be sometime in Feb. We may head west to Puerto Rico, the Dominican Republic, Florida, the Gulf Coast, and end in Texas instead of trying to go further east. 1800 nm of mostly upwind sailing has been enough. Great repair job Tom and Merry Christmas. Tom. I can relate (somewhat). I once undertook to replace an AC compressor in an Opel Manta Luxus, using a very short open end wrench to loosen and then re-tighten four bolts. Took me about six hours, as I rcall, but I had the luxury of doing it while lying on solid concrete and without two lives at stake. Kudos on your successful voyage. For your next trick, why not sail “”round the horn” and in to Ventura Harbor. I’ll buy you a fish-and-chips at Andria’s. Thanks Jim. Well it wasn’t a life and death thing, only convenience. It’s not my boat, but I’m pretty sure the horn is not in its future. The boat will eventually be in its home port of Long Beach.